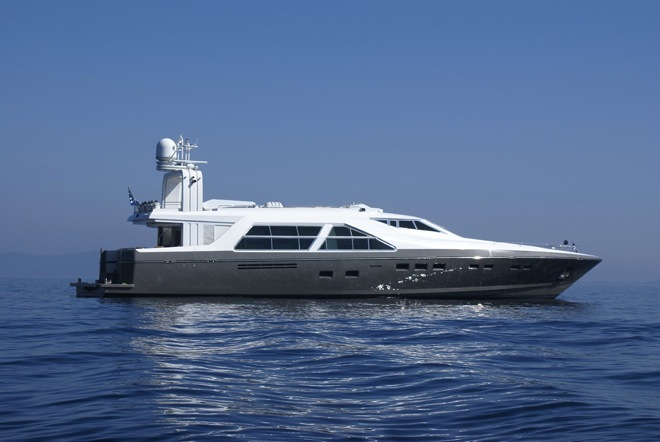 Motor yacht ROSPIYA was built by Devonport yachts in 1995 and measures 39.00m (127' 11") in length. 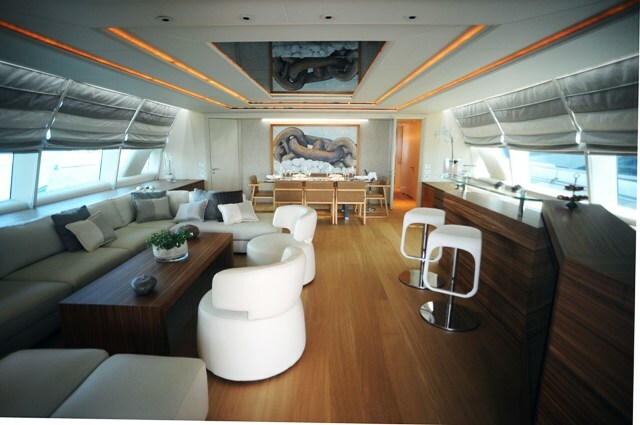 M/Y ROSPIYA was refitted in 2007 and then received a full rebuild in 2010-2011. 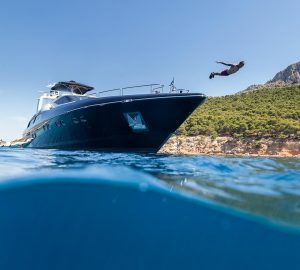 She is able to accommodate up to 11 guests sleeping and cruising and she is based in Greece in the Eastern Mediterranean year round. 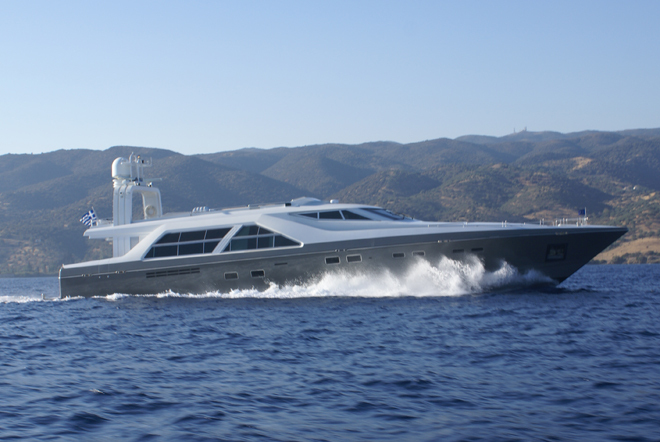 Yacht Rospiya’s hull and superstructure was designed by naval architect Michael Peters and built in Norway. 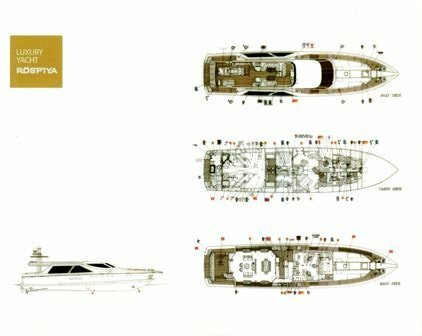 Her interior and all mechanical installations were done by Devonport Shipyard who have built world renowned yachts such as Vava II, M/Y Sarafsa, superyacht Samar, yacht Leander, Talitha G and motor yacht Britannia. 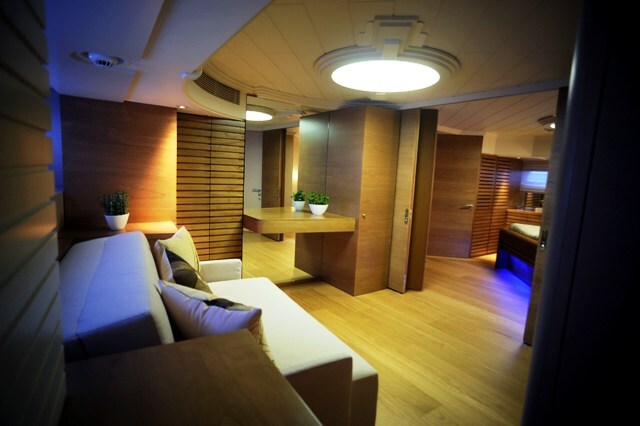 The main salon of M/Y ROSPIYA is accessed via the aft deck by a double sliding door that is completely recessed. The salon features dramatic six square meter windows on each side. Panoramic views and plenty of natural light are offered through the windows which span the entire length of the main deck. 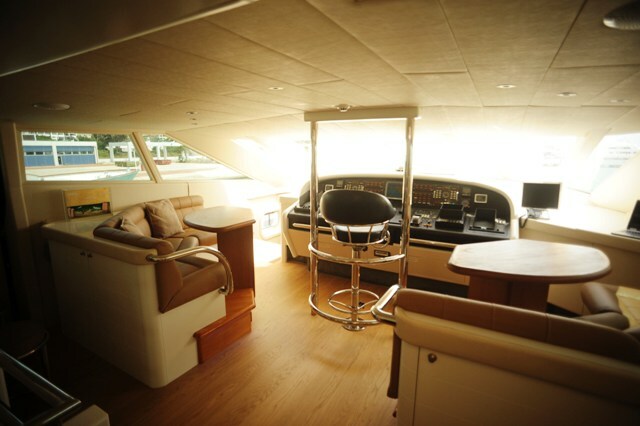 There is an entertainment center with large flat screen TV on the starboard side of the yacht. 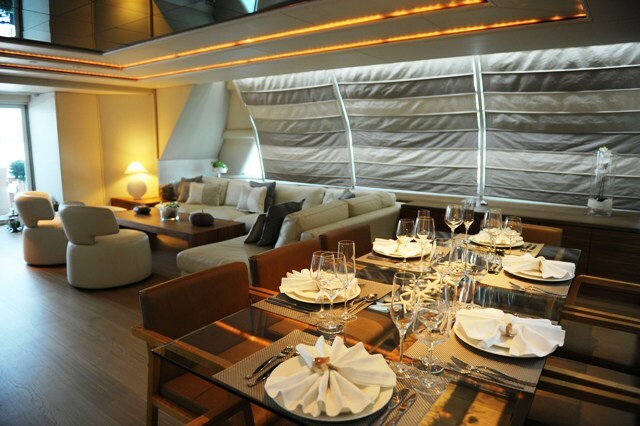 The adjoining dining area seats ten guests. 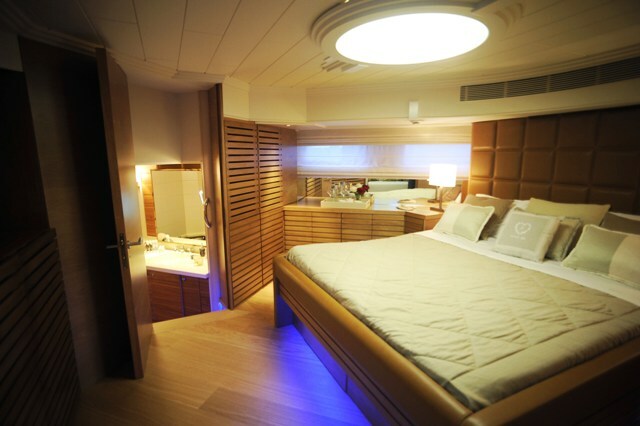 Yacht ROSPIYA can sleep up to 8-11 guests. 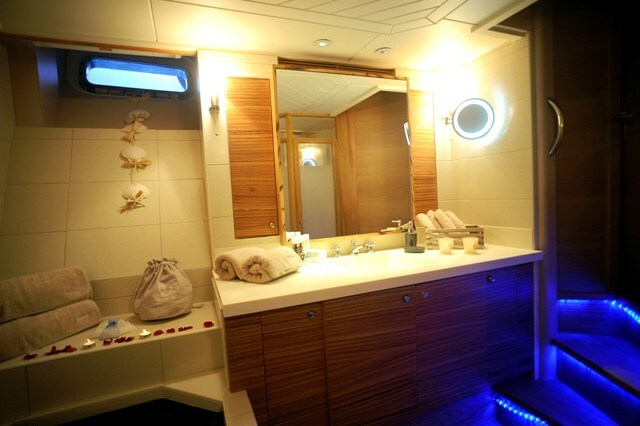 The Master Cabin is located on the lower deck, provides en-suite bathroom with separate shower cabin and hot tub, office, and walk-in wardrobe. The King size bed can be raised remotely at both the head and feet. 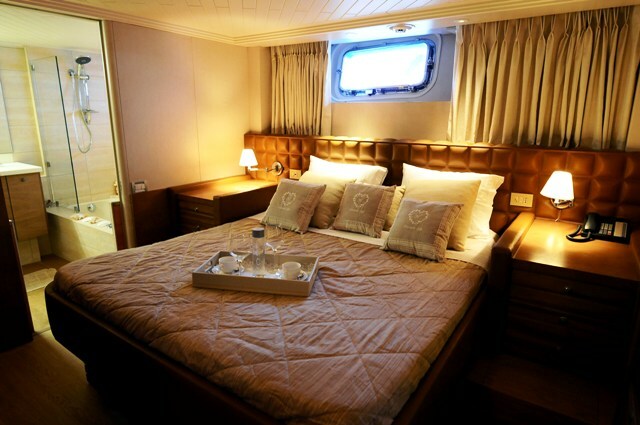 The Master Cabin also has also a sofa which can be transformed to a bed for two more persons, and can be converted into a separate cabin by a twin sliding door, with its own bathroom with shower cabin. 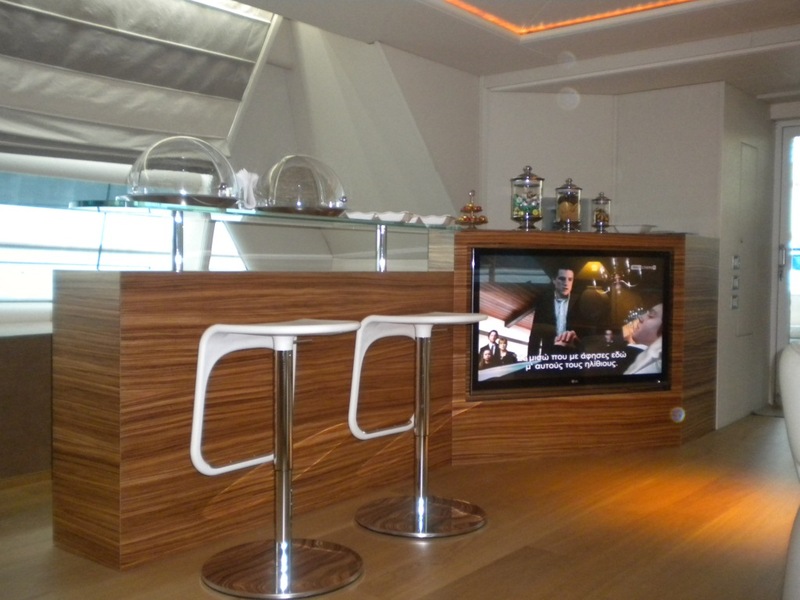 The cabin features a cappuccino and crème décor. 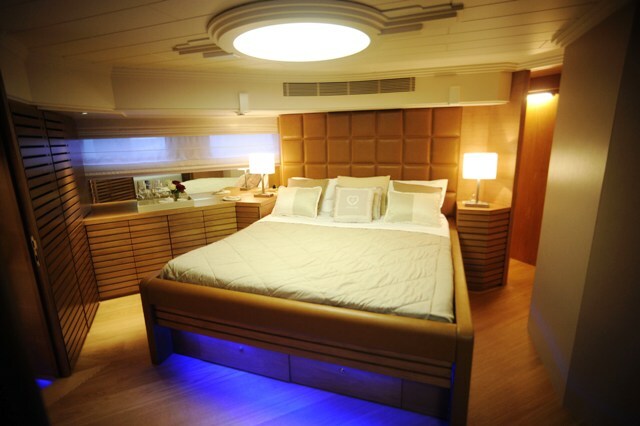 The VIP cabin has a Queen size bed and en-suite bathroom plus a full entertainment center with SAT/TV, media player and IPOD/IPHONE dock. The Double Cabin, situated forward, offers a front window view. It features a full entertainment center. 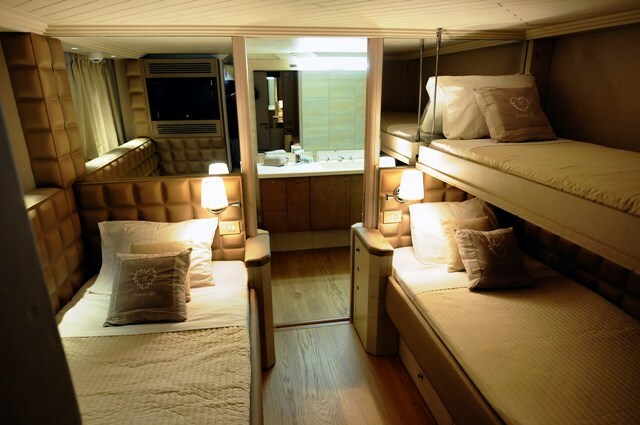 The Triple Cabin onboard yacht ROSPIYA provides three single beds, one of them being a pull-man, and can be easily transformed into a double cabin. 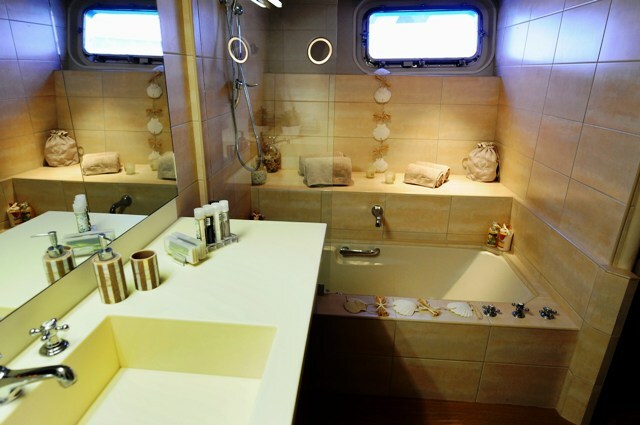 The triple Cabin offers en-suite bathroom and features lighter tones that give an overall minimal impression to the quests. 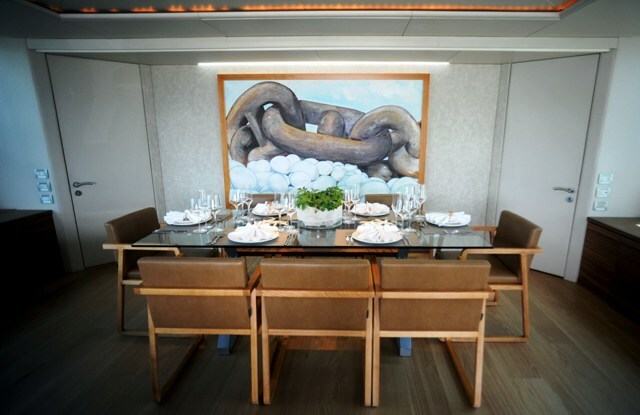 The ROSPIYA motor yacht also has plenty of exterior space with a large sundeck with couches on each side, a dining table and a BBQ to enjoy al fresco meals. 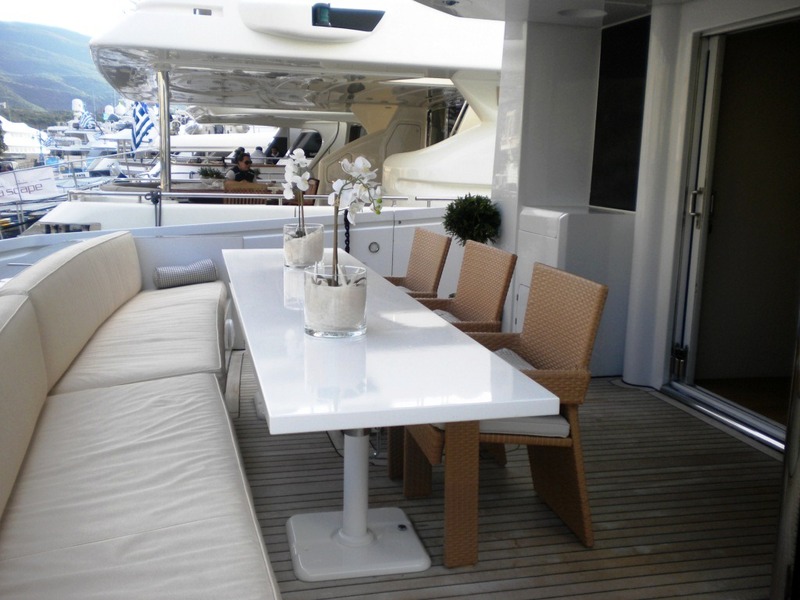 There is further seating and a table located forward as well as another area to enjoy al fresco dining on the aft deck. 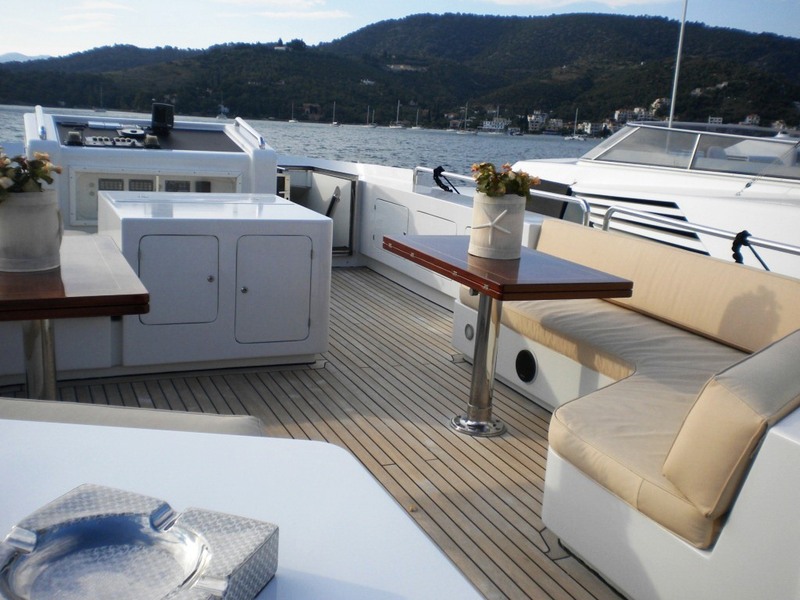 Yacht ROSPIYA has a crew of 5. 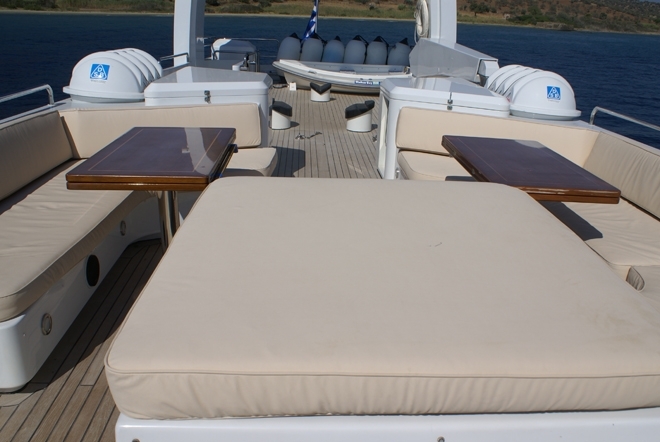 Yacht ROSPIYA can sleep up to 8-11 guests. 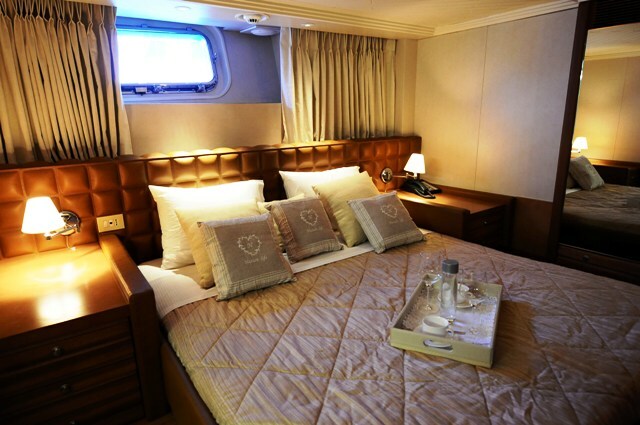 Her cabin configuration includes a Master with two ensuites, one with spa pool tub and one with shower, a VIP cabin with ensuite facilities, a convertible cabin, a double cabin with ensuite facilities and a twin with Pullman berth.